Never heard of the maverick photogenius Gursky? Us neither. Well until we recognised this iconic dystopian photo of an Amazon book warehouse. Well now is your chance to discover the incredible scale of Gursky’s work in a whole new way thanks to London Sinfonietta. In the last of 4 events London Sinfonietta, one of the world’s leading contemporary music ensembles presents two world premieres, from electronic musician and sound artist Scanner (Robin Rimbaud) and Mandel (Emily Hall and Misha Law) – two musicians who generate and develop material together through mindful improvisation. 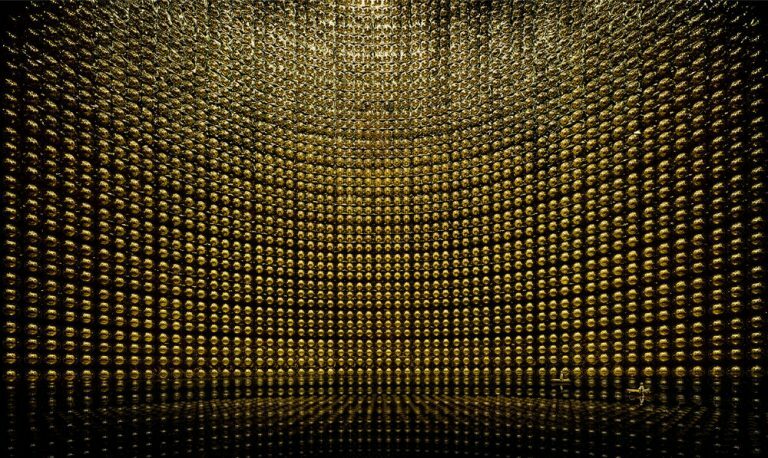 Scanner’s Kamiokande is a sonic response to Gursky’s photograph of the same name; a striking image of the Kamioka Observatory in Japan, which is used to study the behaviour of sub-atomic particles, neutrinos. Scanner’s piece will create a series of sounds and textures for the London Sinfonietta and electronics, capturing the photograph’s innate rhythm and boundlessness; the sound of atoms colliding, the movement of bodies in water, the rush of science at a microscopic scale. 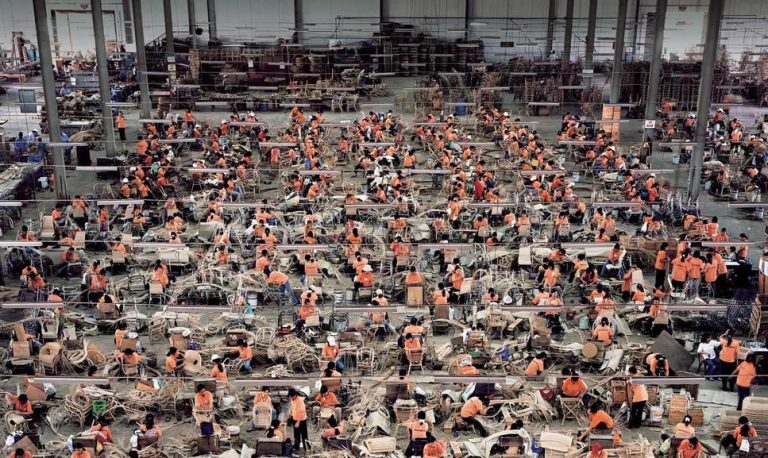 Mandel’s new work is inspired by the photo Nha Trang (2004), Gursky’s image of factory workers in Thailand constructing wicker furniture. The music will evoke the image’s swirling macro and micro perspectives, pointing to a shared sense of what it means to be human. Acclaimed photographer Andreas Gursky creates large-scale, often spectacular images that portray the sites and scenes of contemporary life. From immense man-made structures and vast landscapes to the frenzy of the stock exchange and mass global gatherings, Gursky chronicles our society in dazzling detail and ingenious compositions. Both Hayward Gallery and the London Sinfonietta celebrate 50 years in 2018, and to coincide with this landmark exhibition, the ensemble has commissioned some of today’s most talented composers to create musical responses to his photographs, as part of the future-facing work in its 50th Anniversary Season. Since 1991 Scanner, British artist Robin Rimbaud, has been intensely active in sonic art, producing concerts, installations and recordings, connecting a bewilderingly diverse array of genres. He scored the hit musical comedy Kirikou & Karaba (2007) and Narnia ballet (2015), Philips Wake-Up Light (2009), the re-opening of the Stedelijk Museum Amsterdam in 2016 and installed Water Drops at Rijeka Airport in Croatia. His work Salles des Departs (2003) is permanently installed in a working morgue in Paris. Mandel is a creative partnership between Emily Hall and Misha Law. Drawn together by a common aesthetic, they meet weekly to practice mindful free improvisation mostly on violin and viola then work together to develop this material into fixed pieces of music. Misha Law is a violinist, viola player and singer, as well as a state registered music therapist. Her influences range from minimalism through European and Irish folk music to left field pop. Emily Hall is a member of Bedroom Community, the Icelandic record label. She has written for the LSO, BBCNOW, the Brodsky Quartet, Opera North, LCO, Hungarian Radio Choir, Aldeburgh Music, Streetwise Opera, Mahogany Opera, Crash Ensemble, Lady Maisery. Her music is frequently broadcast on BBC Radio 2, 3, 4 and 6Music. Emily Hall is a recipient of the Paul Hamlyn Foundation Award for Artists, the Genesis Opera Prize, the Royal Philharmonic Society Composition Award and Corinthia AIR.